The lineup of big, wide, long skis designed to tame the mountain’s endless terrain beyond the groomers is only getting bigger and better. If you don’t yet have a pair, what are you waiting for? When the snow gets deeper and the throttle opens up, when the lines are steeper and burlier and you start swinging the cojones, a Big Mountain ski in your quiver will make your day epic. Manufacturers are making these freeride skis to not only slay the rowdiest lines on the hill, but to make a damn good showing on the frontside, as well as make it easier and more enjoyable to get back to the lift as fast and easily as possible. Gone are the short-lived days of full reverse-camber skis that excelled in the deep, but skied like two barrel staves any time you ventured back onto the groomed. With early-rise tips, rockered with camber profiles and a multitude of shapes, plus some good old-fashioned sidecut, the skis are fun, manageable and make a day of ripping the hill a new one so much more fun. In the world of Big Mountain skis, no longer is 90mm at the waist considered excessive. Anywhere up to 120mm can still be a great ski to play on all day: from early-morning freshies to the midday cut-up crud, right to the final bell of skiing to the base. The selection is endless and varied—there’s no reason you can’t find something to suit your desires and, more important, your needs. Meet the Testers. 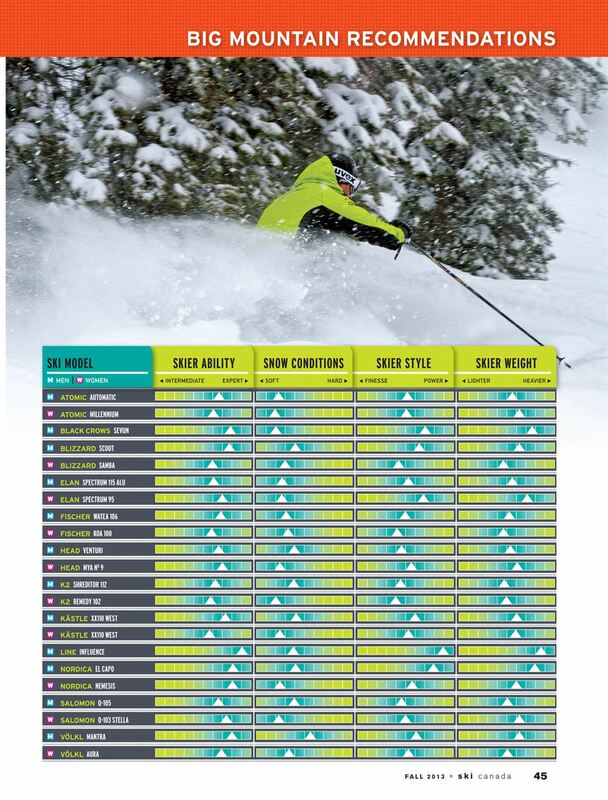 Skiing bios and top 3 scoring skis for each tester. MEN: The deeper the snow, the more fun this ski was. Steve Wall compared it to surfing, saying, “I felt like I was surfing the big wave.” A few testers thought the tip flipped around too much on the hardpack, but as D’Arcy Sego explained, this ski is “solid from the front of the binding back which gives it a true big-mountain feel. The soft tip floats in the pow and gets you in and out of crazy fun lines.” Everyone agreed that the shape and flotation made it a wicked fun ski. MEN: The testers were unanimous in praising the Scout’s go-anywhere, do-anything attitude for the skier looking to expand his technical skills and mountain experience. D’Arcy Sego also praised its powder prowess and great handling, saying, “This ski is great on- and off-piste for use everyday.” Dave Gollogly found it “an amazingly fun, stable, even-flexing ski that performed well and was enjoyable in all conditions.” The Scout will help hone your skills and give you the confidence to go faster—and you’ll have a heck of a lot of fun while doing so. WOMEN: The Samba would please a lighter, more finesse-type skier, but it’s solid enough for the more advanced skier looking for a playful all-round ski. “It has great flotation, turn initiation and edge hold, and can handle various turn shapes and speeds,” Miriam Leishman noted. Heather Robilliard liked how it felt: “Right away this ski feels good under you and you can let it go and trust it. It allows you to ski lightly and aggressively.” This is a comfortable, predictable ski with a big sweet spot for those deep powder days. MEN: “No big boys allowed,” wrote tester (and mesomorph) Erin Keam. Lighter intermediates will appreciate the playful yet solid Spectrum 115 ALU in soft snow. Top scores were for initiation and long radius, but Chris Ebbern thought it could handle short turns as well: “This ski is easy to turn with good float in the pow. Big and small turns require little effort. A fun powder ski!” This is a ski for the strong intermediate skier wanting to cruise the powder at a moderate pace and enjoy the surroundings without it all being a blur. WOMEN: Strong, aggressive big-mountain females take note, “This ski takes no prisoners; it’s stable but tough,” according to Shelley Johnston. The women gave the Spectrum 95 props for its big-mountain capabilities, and as Anne Terwiel stated, “it puts the big in big mountain. Point this baby downhill and hang on. It’s wonderful at speed in all conditions.” Wendy Lemoine loved the ride: “A solid ski that chewed up the fresh snow. On-piste it was smooth and hugged the snow. Big sweet spot with a big engine.” Heavier, advanced-expert skiers need only apply. MEN: A big, soft ski that loved cruising in all conditions, but sometimes the nose let the bigger skier down when the speed picked up. “Softer shovel in the cut-up snow kept me on my…heels,” joked Erin Keam after a rather choppy section of the test run, “but a ton of fun and easy to find the sweet spot.” Meanwhile, big boy Steve Wall was impressed: “It floats like a butterfly, turns like an F-16. An all-round ski that did it all well.” This ski felt lighter than it was, but was still super-stable. WOMEN: Almost every tester commented on the KOA l00’s big sweet spot, forgiving nature and ability to adapt to any type of terrain and turn shape. Stronger ladies like Shelley Johnston noted its need “for a finesse and light-style skier in the soft stuff.” Anne Terwiel found it an “exceptional big-mountain ski that does everything—bumps, deep pow and chop—with complete confidence. It could be light and lively or a powerful machine with speed.” Overall, this ski performed well for a wide mix of women, and surpassed expectations in mixed conditions. MEN: Heavier testers felt the Venturi’s tip was a bit soft and that more “nose” from sizing-up would have helped in the deeper snow. The lighter men, though, were happy with its ability to hold an edge and carve, with D’Arcy Sego noting, “A stable ski for lighter skiers looking to wow the crew as you rip the most impossible terrain. It’s quick edge-to-edge and carves extremely well for this category.” Nearly everyone agreed that this ski had a top speed, and lighter advanced drivers would benefit most from its strengths in varied conditions. MEN: Intermediates looking to improve will love the Shreditor for its playfulness and ease. The ski’s stability and energy offer a great stepping stone to exploring the off-piste. 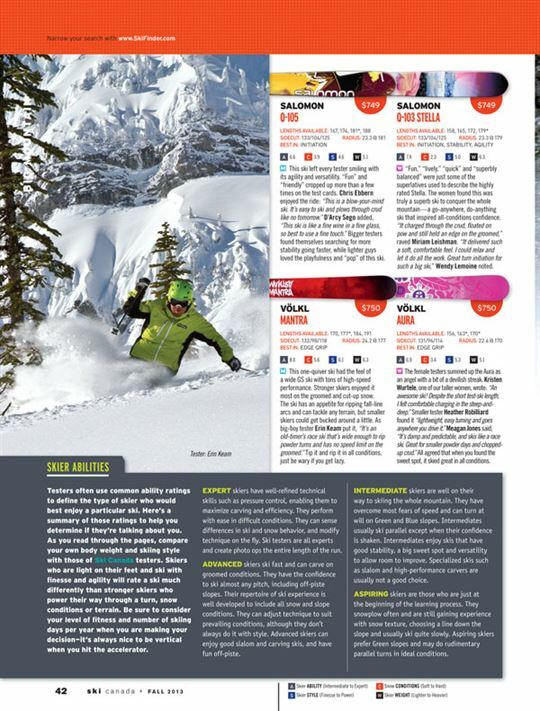 “Shredtastic!” wrote Ryland Nelson, adding, “It’s super-versatile, surprisingly solid in crud and hardpack, and has a lot of energy.” Paul Ouelette agreed: “The softer tip initiates turns really well. It’s stable underfoot, with great energy in the tail. A great ski to play on!” You would do no wrong with this ski when hitting the slopes for a weekend of hooting and hollering. WOMEN: The Remedy was a well-liked ski that our female testers thought an aspiring, lighter advanced skier would benefit greatly from. “Easy, agile and fun. It’s stable, and cuts through bumps and handles landings nicely,” Shelley Johnston said after a playful run. Heather Robilliard was enthusiastic: “This is a fab ski for building confidence. It turns effortlessly and smoothly, and feels like it has its own gas and knows just where to turn.” This ski loved to be finessed in deep snow, and would be a great playful partner on a snowy day. MEN: If you’re a big, strong advanced-expert skier who wants to charge powder and go straight, then you’ll like the Influence. Steve Wall was on board: “This ski was like a freight train—heavy and powerful. It loved big speed and rolled over everything.” Erin Keam added: “Hit the nitrous button and hold on. It wants to go Mach speeds and charge big, steep lines.” The deeper the snow and the higher the speed, the better the ski performed. The big boys were “influenced” by its need for big lines, deep snow, fast turns and strong thighs. MEN: The El Capo begged for a hard-charging, heavyweight skier. As ectomorph Kristian Armstrong noted, “It’s a big, burly ski for the bigger guy who can charge.” Heavyweight Chris Ebbern agreed, “It held its own in all conditions and is easy to ski, but for a lighter guy, it might be a bit more work.” This ski likes to be ridden hard and put away wet, with no complaining other than when asked to skid a little. Tip it on edge and let it run and the ski will give as good as it gets. WOMEN: With its large sweet spot and torsional stiffness, the Nemesis was a rock-solid performer when put on edge in any conditions. Shelley Johnston showed her enthusiasm: “Wahoo! Whatever the mountain throws at you, this ski will help you tame it.” This was a sentiment echoed by many of our female testers, along with comments on its lively and responsive feel. “Don’t hold back—this ski will go,” stated Kristen Wurtele. 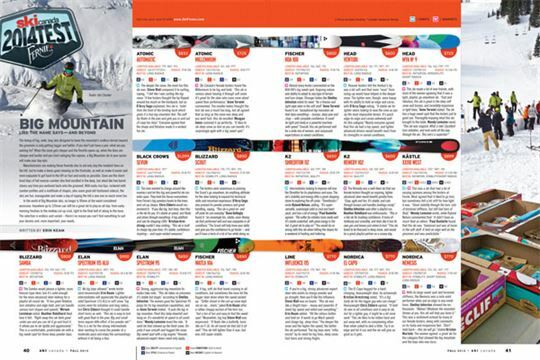 The women agreed: a great ski for the category that showed the big mountain and the boys who was boss. MEN: This ski left every tester smiling with its agility and versatility. “Fun” and “friendly” cropped up more than a few times on the test cards. Chris Ebbern enjoyed the ride: “This is a blow-your-mind ski. It’s easy to ski and plows through crud like no tomorrow.” D’Arcy Sego added, “This ski is like a fine wine in a fine glass, so best to use a fine touch.” Bigger testers found themselves searching for more stability going faster, while lighter guys loved the playfulness and “pop” of this ski. WOMEN: “Fun,” “lively,” “quick” and “superbly balanced” were just some of the superlatives used to describe the highly rated Stella. The women found this was truly a superb ski to conquer the whole mountain—a go-anywhere, do-anything ski that inspired all-conditions confidence. “It charged through the crud, floated on pow and still held an edge on the groomed,” raved Miriam Leishman. “It delivered such a soft, comfortable feel. I could relax and let it do all the work. Great turn initiation for such a big ski,” Wendy Lemoine noted. MEN: This one-quiver ski had the feel of a wide GS ski with tons of high-speed performance. Stronger skiers enjoyed it most on the groomed and cut-up snow. The ski has an appetite for ripping fall-line arcs and can tackle any terrain, but smaller skiers could get bucked around a little. As big-boy tester Erin Keam put it, “It’s an old-timer’s race ski that’s wide enough to rip powder turns and has no speed limit on the groomed.” Tip it and rip it in all conditions, just be wary if you get lazy. WOMEN: The female testers summed up the Aura as an angel with a bit of a devilish streak. Kristen Wurtele, one of our taller women, wrote: “An awesome ski! Despite the short test-ski length, I felt comfortable charging in the steep-and-deep.” Smaller tester Heather Robilliard found it “lightweight, easy turning and goes anywhere you drive it.” Meagan Jones said, “It’s damp and predictable, and skis like a race ski. Great for smaller powder days and chopped-up crud.” All agreed that when you found the sweet spot, it skied great in all conditions. The Recommendations data used in the following chart are also used in SkiFinder to better able skiers to input their skiing characteristics and SkiFinder will filter skis to report the top 3 and all others.